Set on 2.46 hectares (approx. 6 acres) of undulating hillside, this delightful hinterland property offers numerous possibilities for an astute buyer. With two houses on site, it would ideally suit dual living, a multi-generational family, or someone looking to live in one home while generating income from the other. The homes are far enough apart to offer complete privacy, yet close enough for family or visiting friends to move between them. The first home is as-new. The contemporary open-plan living space has large sliding doors opening onto the wide covered deck, allowing in the breeze. On the deck, glass panels allow for uninterrupted, elevated views over the property to the mountains beyond. You'll love sitting outside with a drink and watching the sun set over the hills. The kitchen boasts a window with the same stunning view, and the entire space is air-conditioned. All 3 bedrooms have built-in robes, and the modern bathroom has a shower, bath and separate toilet. This house has a colorbond roof with 5Kw solar to keep those power bills low (serving both homes), plus a double lock-up shed, partial fencing, a waste water treatment plant and approximately 10,000 gallons of water storage. The second home is a story-book timber cottage positively oozing with character. Some of the charming features include pine raked ceilings, brush box floors and more of those gorgeous mountain views. Downstairs is the living zone, comprised of the kitchen, living, dining, and family areas. The kitchen features timber benchtops, gas oven and cooktop, and a wide window with beautiful property views. There is also 2 bedrooms, laundry, and the main bathroom, with shower, bath and separate toilet. A timber staircase leads you to the master bedroom, where your ensuite bathroom comes complete with a deep spa bath. Here, you can soak away your cares while absorbing the tranquil rural outlook. This home has its own garage and workshop, 10,000 gallons water, plus a playground and cubby house for the kids. The peaceful and private location of this property make it a haven for nature lovers. Enjoy the sounds of native birds while harvesting fruit from the variety of trees, including oranges, lemons, limes, mandarins, mangoes, bananas and mulberries. Both gardens are supplied with water from the dam. Build a vegie patch, bring in the chooks and you're ready to live that sustainable lifestyle you've been dreaming of. 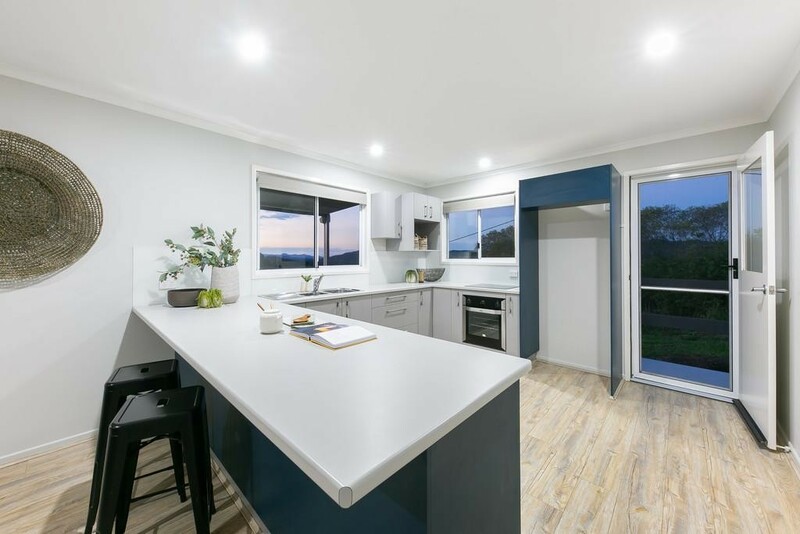 This tranquil rural paradise is less than 20 minutes to the schools, shops and eateries of delightful Cooroy and only 30 minutes to Gympie via the new highway. It will suit a variety of buyers, so be quick to organise your inspection with our agents.